Calibration Maneuvers on a Tuesday? Today SDO did two calibration maneuvers. The EVE field of view started at 1315 UTC (8:15 a.m. ET) and the HMI/AIA flatfield started at 1630 UT (11:30 a.m. ET) and ended at 1900 UTC (2:00 p.m. ET). These motions are used by the instrument teams to track the performance of the instruments. They had been scheduled for October but were delayed to track AR 12192 across the disk and watch its re-emergence. Here is an AIA 171 image at 1540 UTC (10:40 a.m. 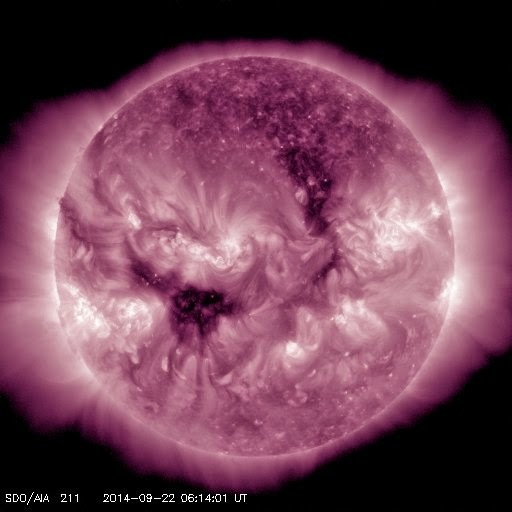 ET) showing a nice coronal loop in the northern hemisphere. 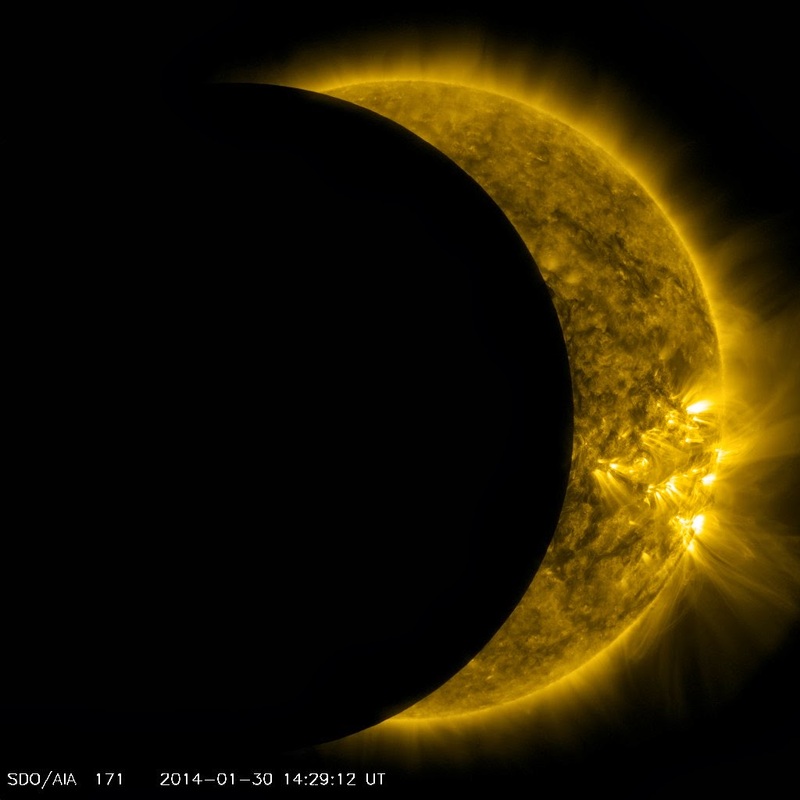 SDO will experience the third lunar transit this year on November 22, 2014. Here is the FOT movie predicting what we will see during the transit. The EVE cruciform is today starting at 1800 UTC. During this maneuver the spacecraft rocks back and forth, helping EVE to maintain an accurate calibration. 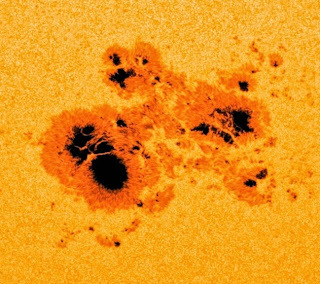 Active Region 12192, which was the location of 6 X-class and several M-class flares in late October, is coming back for an encore. Here is a movie of the Sun showing the magnetic field on the side facing the Earth and the farside image from HMI data. 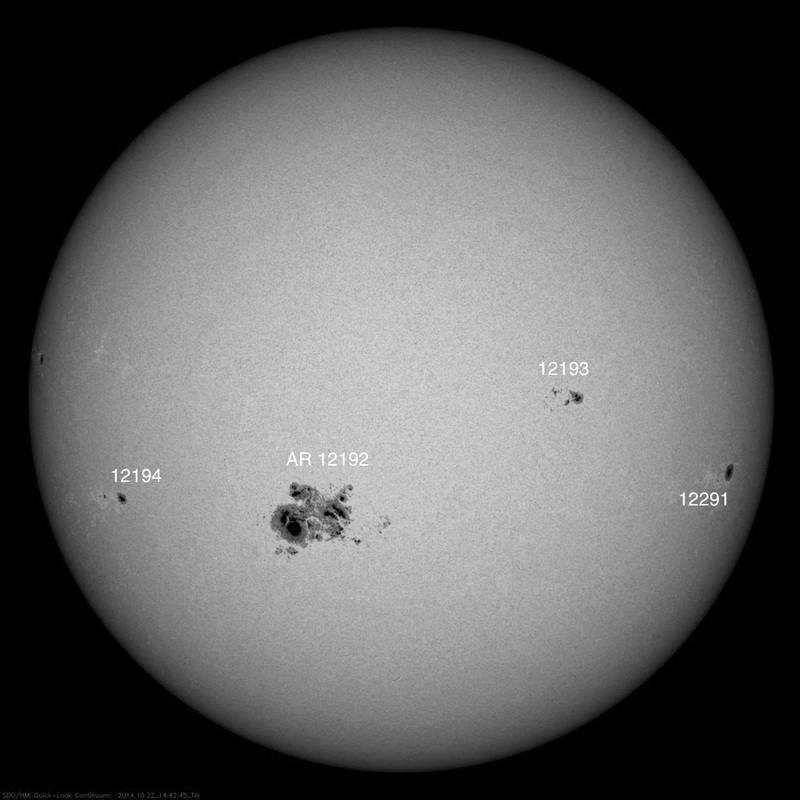 It shows the part of the Sun containing AR 12192 rotating back into view, with a large magnetic feature still there. These composite maps of the Sun’s farside (in yellow) and the line-of-sight magnetic field (blue) show NOAA AR12192 as a bight-dark magnetic feature rotating out of view over the west limb at the beginning, passing the far-side meridian in the middle as a dark area, and approaching the east limb at the end. The farside information is shown as the travel time change in the echo produced by a strong magnetic region. This farside images allow us to track magnetic features where SDO cannot see. They have been compared with the full-Sun images we make by combining SDO and STEREO images. When AR 12192 returns it will have a new number but we hope it will be just as active. Many thanks to the HMI team for producing these images and movies. They are available at JSOC. Repairs are Complete, JSOC is Live! The fiber optics cable is repaired and data is flowing to the JSOC. It's good to see the Sun! The SDO JSOC is recovering from an internal disruption and images are unavailable. This outage should last 24 hours. Update 11/5/2014 2142 UTC: We have learned that the fiber cables between WSMR and Stanford were accidently cut. This outage will continue until the location has been determined and the lines repaired or bypassed. The problem at the JSOC has been fixed and, until this new outage, the image cadence was being restored. Update 11/6/2014 1447 UTC (9:47 am ET): The fiber optics provider has found the break, dug it up, and should be splicing the fiber links soon. I do not know how long each fiber takes to splice or how many fibers are in this bundle, so there is no estimate at this time when we will return to service. What’s at the Center of the Sun? Here is an illustration of a rocket flight from the surface of Earth to the center of the Sun. 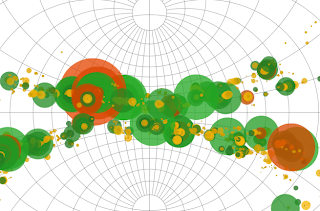 A few altitudes in each atmosphere are shown. The Earth altitudes are the surface, tropopause (where airliners fly), and the Kármán line (the boundary between our atmosphere and space). 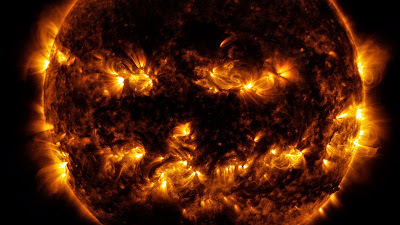 The Sun shows the photosphere (the visible surface of the Sun), the bottom of the convection zone, the top of the nuclear core, and the center of the Sun. I used atmospheres (atm) as the unit because 1 atm is the pressure we are most used to. "No one will ever know what is at the core of the sun. How do the scientist know what’s at the core, have they been in there? Did they actually build something that can withstand the heat of the sun to go in there and look?" Amazing as it seems, we know quite a bit about the conditions at the center of the Sun. They are measured in two independent ways, sound waves and neutrinos. We also build models of the Sun that use what we know about the physics of plasmas that must agree with those measurements. Let’s think about the models first. Stars live in a state of precarious balance between gravity trying to pull material inward and pressure pushing the same stuff outward. At every altitude in an atmosphere the pressure needs to be sufficient to hold up the mass of material above it. You live at the bottom of an atmosphere. The mass of the atmosphere above you produces a pressure at the surface of (believe it or not) 1 atmosphere! It is also a pressure of 1015 mbar or hPa. How does an atmosphere work? Think of the atmosphere as having layers that start at the ground and going toward space. If you move from the lowest level (at the ground) up to the next level we find that the pressure is smaller because the higher level supports less mass. As we continue moving up the pressure continues to decrease until finally the density is too low and we say we are in outer space. Astronomers know how to use these models to estimate the pressure, temperature and density in the core of the Sun. The simplest models give a core temperature of 20 million K, a core density of 75 gr/cm3, and a central pressure of 1.2e17 dyne/cm2. That is a pressure of 120 billion atmospheres! Even at these incredible pressures the core of the Sun is hot enough that the material remains a gas. More accurate models that follow the fusion reactions that power the Sun give the pressure as 2.4e17 dyne/cm2 (230 billion atm), a temperature of 15.7 million K, and a density of 154 gr/cm3. 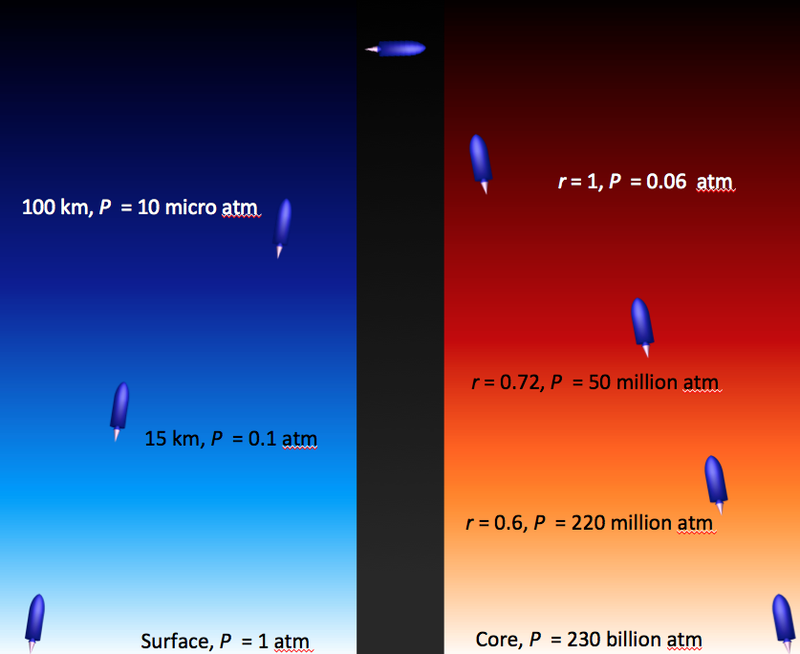 The illustration shows some pressure values at some altitudes in the atmospheres of the Earth and Sun as if we could fly a rocket to the center of the Sun. But scientists are skeptical of models and those numbers should also be checked by a measurement. This led to one of the great debates of physics, the core conditions deduced from Sun’s sound waves and the core deduced from the observed number of neutrinos, known as “Solar Neutrino Problem”. When the velocity of the solar surface is analyzed we find that it is made up of millions of waves moving with measurable frequencies. These waves also move around inside the Sun. Roughly speaking the lower the frequency of the wave the deeper the wave moves into the Sun. We can also calculate the frequencies of the waves that move in the models we built earlier. Because there are so many waves, matching the model and observed frequencies gives a very good check on our model. (This is like tuning a large bell or pipe organ.) Our current model agrees very well with the observed frequencies. That means the sound waves confirm that the temperature and pressure at the center of the Sun agrees with the frequencies from the accurate model of the Sun. Another check on this comes from the neutrinos that are emitted by the fusion reactions in the core of the Sun. Neutrinos are neutral particles that interact very poorly with other particles. They have very small masses and come in three flavors, electron, muon, and tau. Neutrinos are very difficult to detect but would tell us whether the reactions used in the model were correct. When they were first detected, the meaasured number of neutrinos did not agree with the model that worked so well for the waves. Less than half of the number predicted by the model were observed! After much research, such as changing the model near the core to reduce the fusion reactions and the calculated number of neutrinos the model would emit, a new theory of neutrinos was tried. The Mikheyev-Smirnov-Wolfenstein (MSW) effect causes neutrinos to change flavor, from electron neutrino to muon or tau neutrino, as they move through matter. Could this be the reason for the “Solar Neutrino Problem”? The first neutrino flux measurements in the Homestead Mine were of only very high energy neutrinos. Lower energy fluxes from the Sudbury Neutrino Observatory showed that most of the neutrinos produced by the fusion reactions in the core of the Sun, all of which are electron neutrinos, are changed into muon and tau neutrinos by the time they reach the Earth. Once this particle physics concept was confirmed, the central temperature of the Sun from the sound waves is confirmed. People have thought about the center of the Sun for over 100 years. 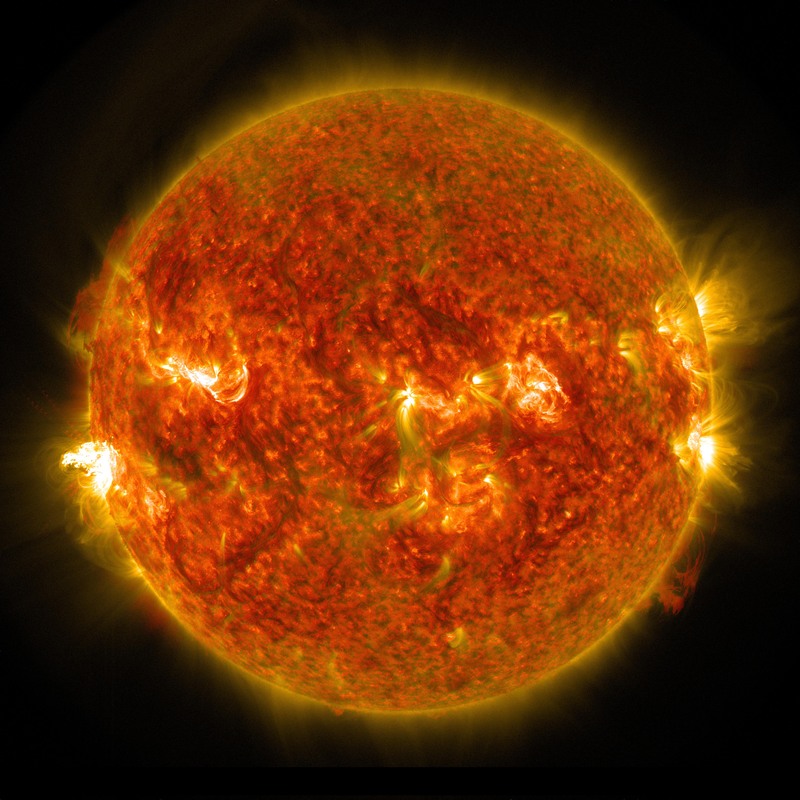 The models of the Sun are based on the 1983 Nobel Prize winning work by S. Chandrasekhar and W. A. Fowler. The 2002 Nobel Prize in Physics was awarded to R. Davis and M. Koshiba for the first detection of cosmic neutrinos. T. Duvall, a scientist who works with SDO data, recently won the AAS/SPD Hale Prize for his work using the sound waves to understand the inside of the Sun. That’s how we know the conditions at the core of the Sun. 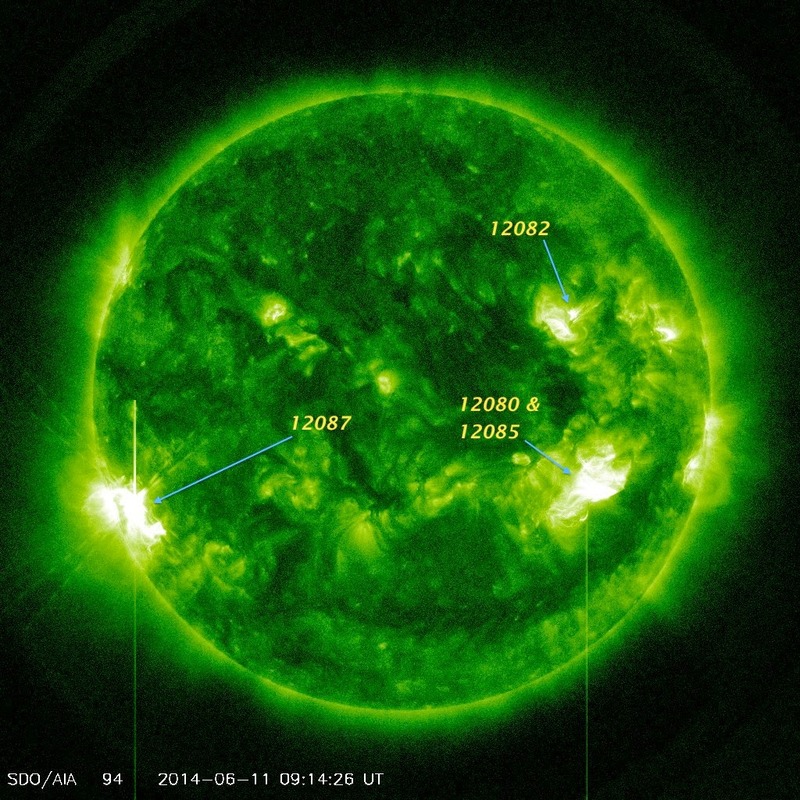 On Aug. 24, 2014, the sun emitted a mid-level solar flare, peaking at 8:16 a.m. EDT. NASA's Solar Dynamics Observatory captured images of the flare, which erupted on the left side of the sun. Solar flares are powerful bursts of radiation. Harmful radiation from a flare cannot pass through Earth's atmosphere to physically affect humans on the ground, however -- when intense enough -- they can disturb the atmosphere in the layer where GPS and communications signals travel. This flare is classified as an M5 flare. M-class flares are ten times less powerful than the most intense flares, called X-class flares. On Friday August 29, 2014 the Fall 2014 eclipse season begins. Each day until September 21 the Earth will pass through the SDO telescopes' fields of view. These are opportunities to see the absorption of the solar extreme ultraviolet by the Earth's atmosphere, showing how high the atmosphere goes. Stationkeeping burn #9 will happen next Wednesday (September 3, 2014) at 2245 UTC (6:45 p.m. ET). 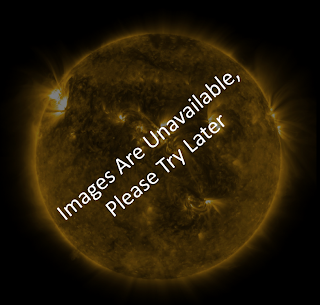 SDO data will be unavailable for about 30 minutes starting 2240 UTC (6:40 p.m. ET). Just after eclipse seasons ends we have the second of three lunar transits in 2014. It will happen on September 24, 2014 from 0650-0720 UTC (2:50-3:20 a.m. ET). Here is the animation of the transit from the SDO Flight Dynamics Team. SDO will execute Momentum Management Maneuver #20 today from about 1915-1945 UTC (3:15-3:45 p.m. ET). This Delta-H burn is used to keep the reaction wheels within their speed limits. During the maneuver the science data is usually not valid as the spacecraft moves around. We are looking forward to eclipse season starting August 29, 2014, giving us another opportunity to see the Earth's limb against the Sun. Eclipse season ends September 21, just in time for a lunar transit on September 24 from 0650-0720 UTC (2:50-3:20 a.m. 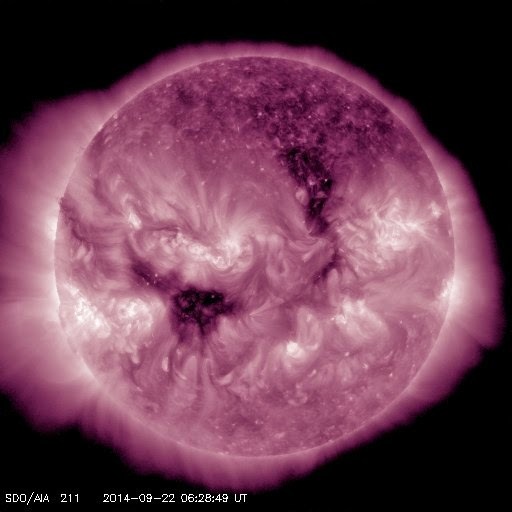 ET).A station-keeping maneuver will happen on September 3, 2014, at 2245 UTC (6:45 p.pm. ET). On July 9 SDO did the EVE FOV and HMI/AIA Flatfield maneuvers. You may have seen the images from AIA wiggle and blur during these maneuvers. This is a normal part of running a solar observatory in a geosynchronous orbit. This week we have the EVE cruciform maneuver on Wednesday, July 23. On Saturday, July 26 we will have a lunar transit. Here is a short movie showing how the Moon moves through the SDO field of view. The transit lasts from 1457–1542 UTC (10:57-11:42 a.m. ET). It isn't a very long transit, nor does the Moon cover a lot of the Sun. SDO will watch two more lunar transits this here, so stay tuned. The Sun had a spotless day on July 17! According to the SIDC there were no sunspots on the Sun that day. The average sunspot number for 2014 remains at 90, even though the daily value has been as high as 150. This was the first spotless day since 2011. Unlike the spotless days in 2009-2011, several small sunspots appeared that day. They weren't seen at the earlier time used by the official observer. Here is an HMI with the sunspot circled. They were pretty small sunspots! Recently I was working at the City Skies Solar Workshop at the Franklin Institute. This program brings middle school teachers and community center leaders together to provide STEM activities at the centers with the teachers ensuring the science content. It’s a really nice program that SDO has worked with for two years. During the June workshop one of the center leaders asked, “What is a magnetic field?” Now that should be an easy question to answer. SDO/HMI measures the magnetic field of the Sun (see today's solar magnetic field map on the left); we use compasses to find directions using the Earth’s magnetic field. So, what is a magnetic field? It wasn’t as easy to answer as I thought. A magnetic field is one of the fields used to track forces. It gives us a recipe to describe magnetic forces around the source of the field. Gravitational fields are used to describe the orbits of planets around the Sun. Electric fields describe how currents flow in the power grid and how radios work. A magnetic field is how we keep track of the magnetic force created by many moving particles (or electrical currents). There are two nuclear fields as well. Fields are not simple concepts. They do not follow our usual experiences. A concept like Newton’s law of motion, that force is equal to mass times acceleration, can be seen every day. But even though they are invisible, fields are as real as the forces they allow us to calculate. The magnetic force doesn’t work in the way the electric and gravitational force work. Both of those draw particles together (or make them move apart for like electrical charges). Only moving charges can feel the force from a magnetic field. As soon as a particle feels the effect of a magnetic field it starts to move in a circle. The speed of the particle doesn’t change but the direction of the velocity does. This makes a magnetic field a good deflector of particles. There are only the holes at the poles that allow particles in. 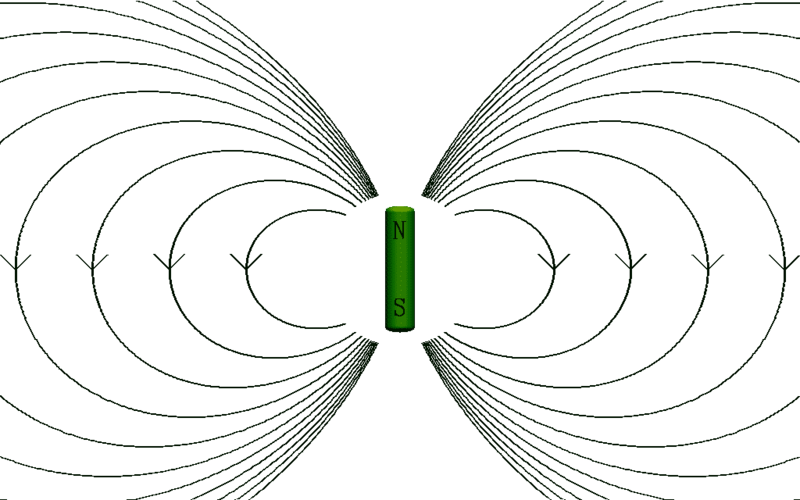 Magnetic fields come from electrical currents, whether in the Sun or a magnet. 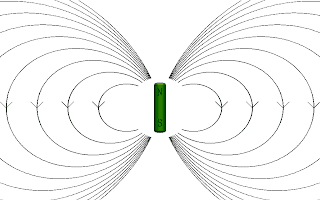 The strength of magnetic forces can be greater than the force of gravity (that’s why magnets work) but it is weaker than the electric forces between charges. It also works when the source of the magnetic field is electrically neutral! Magnetic forces from those fields push around moving charged particles. Those moving charged particles also produce a magnetic field. Interesting things, like the solar dynamo, happen where the strengths of the magnetic fields from the two sets of moving charged particles are about the same. By concentrating on what a magnetic field does to the charged particles moving through it we are acting like the scientists who first tried to understand why compasses were affected by electrical currents in nearby wires. They also mapped the shape of magnetic fields on Earth with iron filings (and more complicated instruments). On the Sun we can trace the magnetic field in the corona using EUV images (such as from SDO/AIA). Newer instruments can measure the actual coronal magnetic field, which can be compared with how the plasma moves in the EUV images. We use the Zeeman effect on iron atoms by measure the magnetic field near the surface of the Sun. Those scientists also began thinking about fields and started us down the road to modern physics. What is a magnetic field? A magnetic field is the region of space near a body where magnetic forces due to the body can be detected. It’s the reaction of the particles that counts, not the region. Edited 08/05/2014 to fix the bar magnet picture. I am very sad to say that SDO has decided to turn off EVE MEGS-A and EVE SAM. The EVE MEGS-A/SAM instrument has had a failure in the CCD electronics. The EVE team is looking at ways to start them again, but we do not have a date for restarting the instruments. 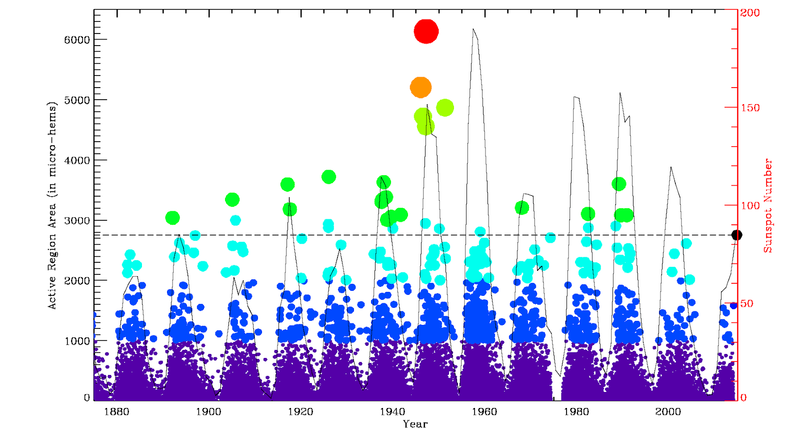 The discovery of late-phase flares depended on the linking of MEGS-A spectra and AIA images. The SAM images were made by a pinhole camera, but had a remarkable accuracy in determining the location of flares. MEGS-B, MEGS-P, and ESP are working as designed. This letter from Tom Woods, the EVE PI, was sent out yesterday. We're sad to report that EVE MEGS-A / SAM data stream has ended on Monday May 26, 2014 due to a power anomaly for MEGS-A CCD electronics. With the SAM images being from MEGS-A CCD, both SAM solar X-ray images and MEGS-A spectra (6-37 nm) are not available now. The MEGS-A and SAM data from May 1, 2010 to May 26, 2014 will remain available from the EVE web site ( http://lasp.colorado.edu/home/eve/ ). All the other EVE instruments are working well, ESP, MEGS-B, and MEGS-P. We¹ll be working with the EVE science team to optimize the EVE observations with those instruments. X-class Solar Flares from Space and the Ground! Wondering what else we need to know to understand X-class solar flares? Join SDO and others on a Google+ Hangout today at 2:30 pm ET. We will describe an X1 flare that happened 29-Mar-2014. It was the first X flare observed by IRIS and was also seen by SDO, SoHO, Hinode, RHESSI, and the Dunn Solar Telescope in New Mexico. When IRIS watches a solar flare it can measure how fast the plasma is moving, a huge clue to how flares work. This flare produced a nice coronal dimming going over the pole that was described in an earlier blog post. The Hangout URL is: https://plus.google.com/events/c99gnf2e4l9vb4n6logpsemkhlo, staring at 2:30 pm ET and going aboit an hour. 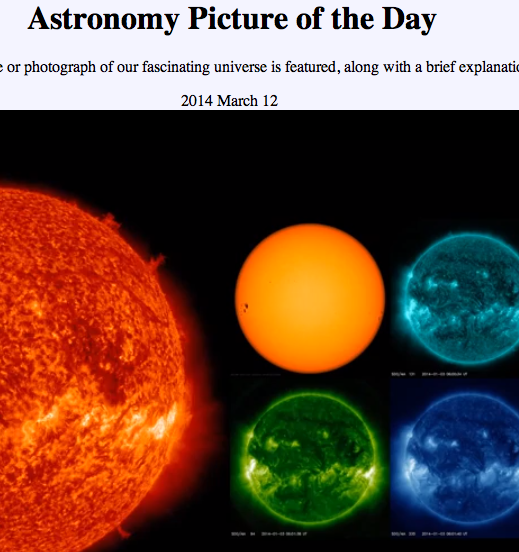 CNN featured a picture of the March 29 flare in Pictures of the Week! The X-1 flare on Saturday produced a very nice example of coronal dimming. 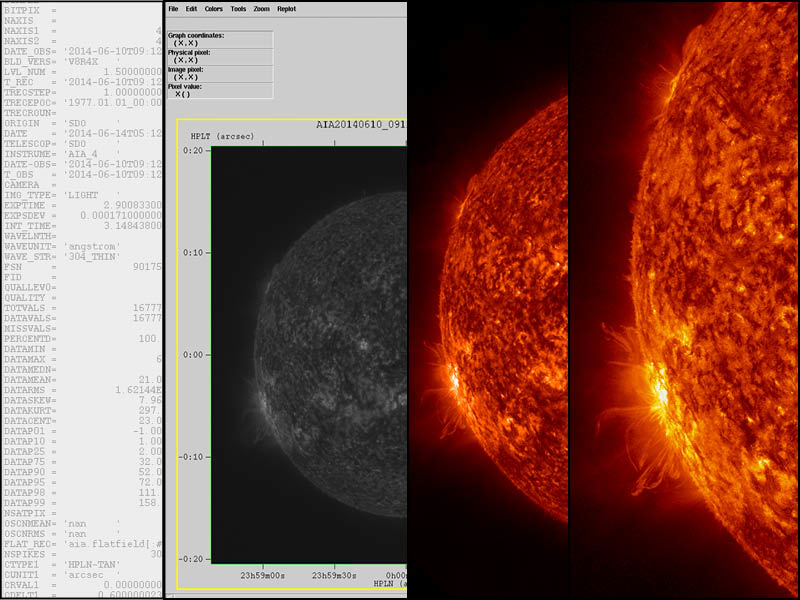 Here is a short movie showing five hours of the Sun in the AIA 193 passband. After the flare happens in the upper right quadrant at 1755 UTC on March 29, 2014, a dark region spreads over the north pole. This is a coronal dimming event. There are many ways to interpret these dimming events. Are they the edges of the coronal mass ejection that left the Sun at the time of the flare? Are they waves moving past magnetic field lines and making them sway? Whatever it is, it moves fast. 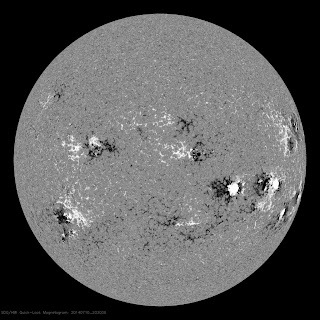 Active Region 12017 is at 10°N 48°W. If something moves from there to the north pole of the Sun (90°N) in 45 minutes it had to move at about 360 km/s (800,000 mph). I only see the dimming moving north. Wherever coronal dimmings come from, they look pretty cool. Today at 1840 UTC (2:40 pm ET) SDO will execute a momentum management maneuver. For about 45 minutes from 1815 to 1900 UTC SDO data may be unavailable. An very nice animation of SDO images for the month of January 2014 is featured on the Astronomy Picture of the Day for March 12, 2014. The images show the brighter active latitudes on either side of the equator, a coronal hole in the northern hemisphere, and filaments covering the disk of the Sun. In the HMI visible light image in the six-image montage you can see the sunspots that make up the active regions. The image is too small to see the faculae that go along with sunspots, but the latest HMI flattened image shows them quite well. January's 31 days are a little longer than one solar rotation of 27.27 days. That means you see a part of the Sun that is just off limb at the beginning of the month a second time as that part of the Sun rotates back into view. Active region 11944 is present throughout the month in the southern hemisphere and reappears as AR 11967 at the end of the movie. AR 11946 grows in the northern hemisphere and will reappear as AR 11968. AR 11944 will also return as AR 11990 in late February. On February 25 it will be the location of an X-4.9 flare as it rotates back into view. Long-lived active regions are a sign that solar maximum is here and starting to fade. Today at 2035 UTC (5:35 pm ET) SDO will execute a stationkeeping maneuver. 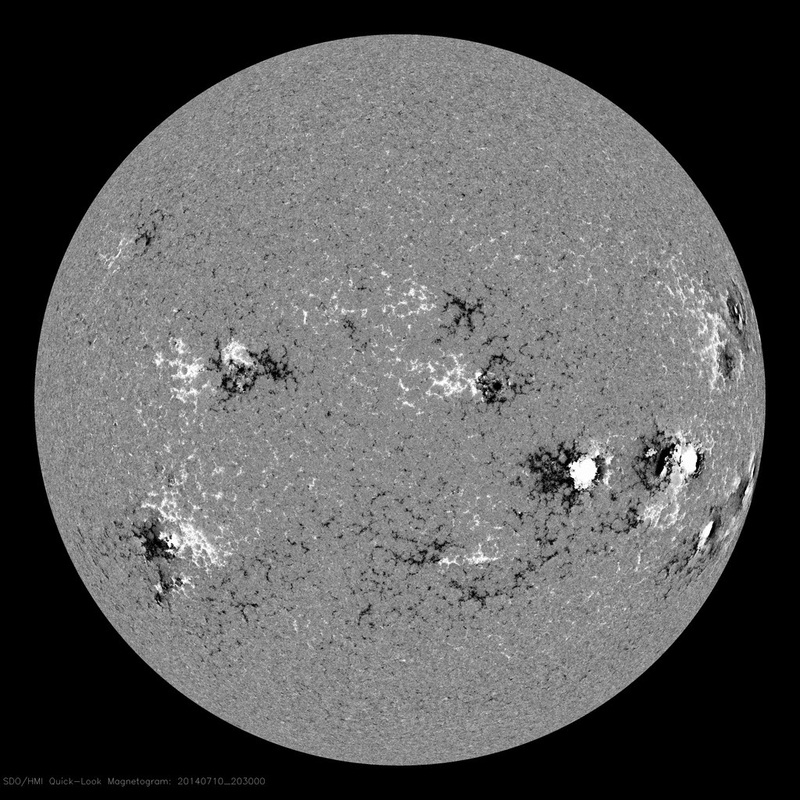 For about 45 minutes from 2015 to 2100 UTC SDO data will be unavailable. 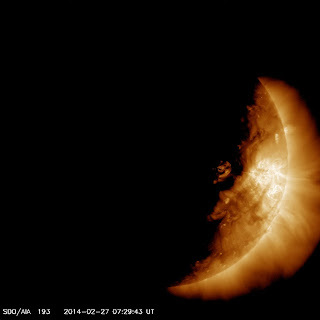 The SDO 2014 Spring Eclipse Season has begun! For the next 3 weeks the Earth will pass between SDO and the Sun around 0730 UTC each morning. They start short and last up to 72 minutes before tapering back to short. Here is an image from our first eclipse. It is always nice to see the ragged edge of the Earth's atmosphere as the bright spots on the Sun shine through while the dimmer regions disappear. Here we can see AR 11988 near the edge of the Earth, with a coronal hole just to the right. Active regions 11981-11984 are further to the right and are hardly affected by the Earth, although they soon disappear behind the Earth. When SDO can't see the Sun we don't get data. Eclipses are one of our largest data holes. But the orbit gives us 24/7 access to the data flow. So far we have received 98% of the data, so the eclipses aren't a problem but they are pretty! This morning the Sun released an X4.9 flare from AR 11990 at 13 S, 78 E on the solar disk. It can be seen in this AIA 94 image as the bright area on the left of the image. It appears that there is a filament leaving the Sun as well in this image from 0047 UTC. The flare lasted from 0039 UTC until 0103 UTC. The area of impact would be the sunlit side of Earth, with the greatest effects at the sub-solar point. Any coronal mass ejection from this location is unlikely to hit the Earth but might be measured by the STEREO spacecraft. When I think about solar maximum it isn’t just sunspot number. I think about how bright the Sun has gotten in the wavelengths of light that cause space weather. Satellite drag and radio outages are two space weather effects that are caused by light at extreme ultraviolet (EUV) wavelengths, roughly 10-125 nm. This light is so completely absorbed by the atmosphere that it never reaches the surface of the Earth. In space we must be to see the EUV. Here is a squiggly line chart of the Sun's EUV brightness in six wavelengths, averaged over each day. The data come from EVE on SDO. The squiggles start in May 2010 and continue until February 2014. I plotted the logarithm of the brightness to make all of the lines visible. As the Sun emits more light at one wavelength the squiggle goes higher on the chart. Each line has a different color and they are labeled to the right with the element and wavelength of the line. The other number is we will explain in a minute. He II 304 is the brightest, followed by C III 977 and H I 1026. The three iron wavelengths are next. You can make similar plots of each wavelength with the EVE data browser on the SDO website. Since SDO was launched each of these wavelengths has gotten brighter in its own way. The peak He II 304 irradiance was in February 2014 and a horizontal line is drawn at that value. The smallest He II 304 value was in June 2010 and another horizontal line is drawn at that value. The ratio of the brightest to the dimmest is 2.1. The same max and min lines are drawn for the H I 1026 irradiance, with a ratio of 1.7. The Fe XVI 335 wavelength is 12 times brighter, the biggest ratio of these wavelengths. We now see that the other number in the label is the ratio of the brightest to the dimmest the Sun has been in the EVE data. 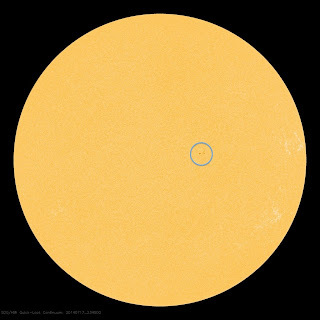 The biggest monthly sunspot number so far in Solar Cycle 24 is 97 in November 2011. I drew a vertical line at that date. The sunspot number was 91 for January 2014, a little less than November 2011. The iron wavelengths are all about the same brightness now as they were then, but He II 304 is distinctly brighter now. H I 1026 is as bright now as it was in November 2011. These differences in brightness during solar maximum show how complicated the sunspot cycle is. 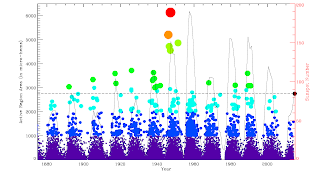 These data show why it so difficult to say when solar maximum happened. Each wavelength has a different timing of it’s peak brightness. Even as we use sunspot number to say when solar maximum was, we should keep in mind that solar maximum is not a point in time but extends over several years. This morning we are moving the computers that host the SDO website into a new server room at Goddard. The website will be offline for about 1 hour starting at 1500 UTC (10 am ET). The EVE Field of View and HMI/AIA Flatfield maneuvers that were delayed from last Wednesday will be run today. Four Years of SDO and A New Look for our Website! It was a cold day in Florida when SDO was launched on February 11, 2010. The Goddard Space Flight Center, along with much of the East Coast of the US, was snowed in with 4 ft of snow. 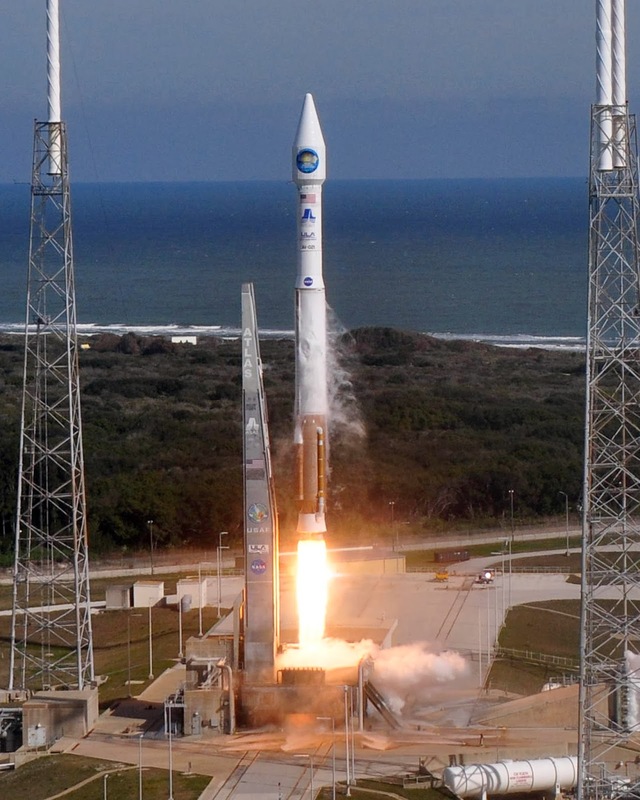 The launch went beautifully and we started returning science data in April. 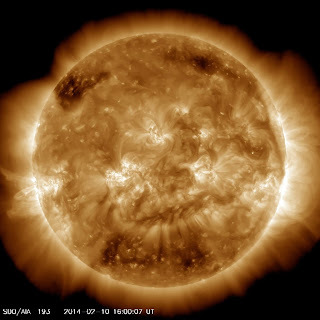 To date, SDO has returned over 130 million images of the Sun. There are over 2000 papers discussing SDO in the NASA ADS abstract service, with 750 different people as first authors. 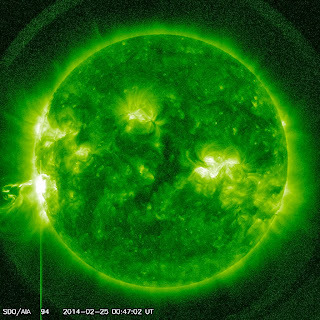 We provide data to space weather forecasters and the public. It is nice to see SDO movies showing a prominence eruption on the nightly broadcast news, especially in the below-average level of activity we are seeing in Solar Cycle 24. As we begin the fifth year of our prime mission we have updated our website. The main goal is to make it work more easily with mobile devices. The links should be the same, pointing you to the near-realtime SDO images. 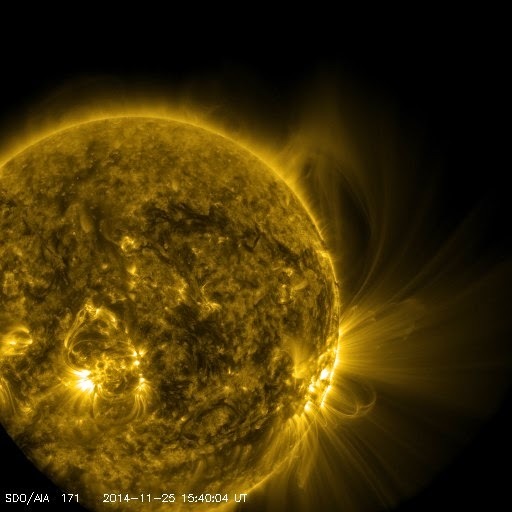 Try out the new website at http://sdo.gsfc.nasa.gov. Tell us what you think at the SDO Twitter feed. 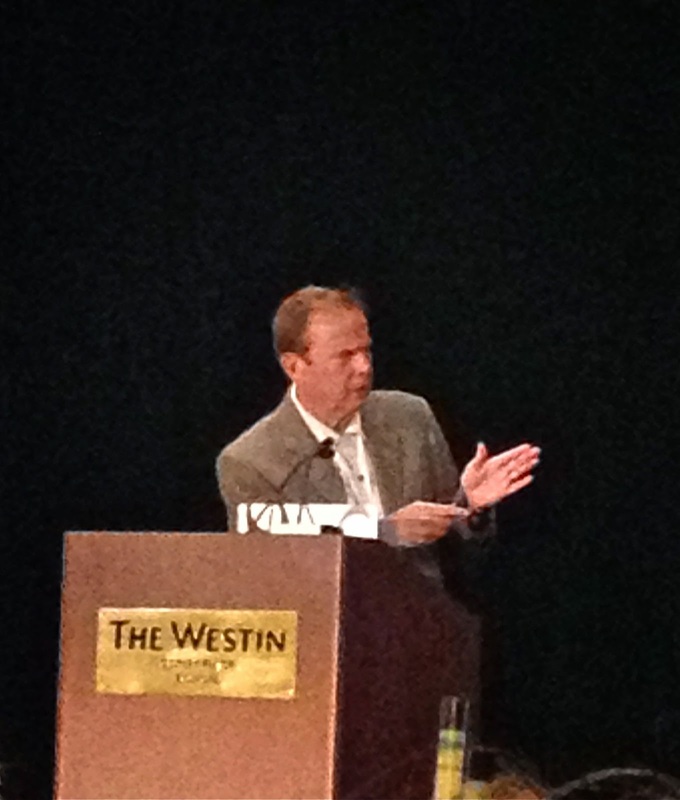 Thanks for looking at SDO data and making us a great mission. Here's an AIA 193 image that seems to have the Sun smiling at us as we start our fifth year. Today the Moon passed between SDO and the Sun from 1331-1556 UTC (8:31-1056 am ET). At 2.5 hours in length, it was the longest lunar transit so far in the SDO mission. You can watch the transit using the browse data option on our website. Use the times 2014-01-30 00:00:00 and 2014-01-30 17:00:00 and your favorite wavelength to enjoy the show. Here is an image from 2014-01-30 14:29:12 in the AIA 171 passband. If you watch the movie you will see the Sun move a little bit during the transit. This transit covers a lot of the solar disk and blocks the sunlight from SDO. The fine guidance systems on AIA and HMI can't work because they need to see the whole Sun to keep the images centered from exposure to exposure. Once the transit is over the fine guidance systems started back up, giving us steady images of Sun. And, as the Moon left SDO's field of view, an M8 flare erupted in AR 11967. It looks like we will have three lunar transits in 2014, including one on 30-Jan that lasts almost 2.5 hours. 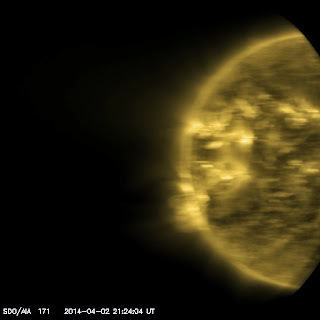 Here is a video that shows how the long transit will look from SDO. Today, January 4, at 1200 UTC (7 am EST), the Earth was at perihelion. This is when we were closest to the Sun in our orbit around the Sun. At perihelion, the center of the Earth was a little over 147 million km (about 91.4 million miles) from the center of the Sun. Why do we care? The Earth orbits the Sun along an ellipse. That means sometimes we’re farther from the Sun and sometimes closer. The average distance of the Earth from the Sun is about 150 million km (about 93 million miles, one Astronomical Unit or AU). Perihelion is the starting time for that orbit. The distance of perihelion is also important. The perihelion distance of the Earth is about 1.67% closer than the average distance. When the Earth is closer to the Sun it receives more sunlight and when it is further away it receives less sunlight. That means the timing and distance of perihelion can affect our climate. That doesn’t mean that being closer to the Sun automatically means warmer weather. Our seasons are caused by the tilt of the earth’s rotation axis compared to our orbit around the Sun. In January the northern hemisphere of the Earth is tilted away from the Sun and the northern latitudes have winter. At the same time those living in southern latitudes experience summer. Because the tilt determines the seasons we mark our seasons by the solstices and equinoxes. But the changing distance does affect our climate. It appears to make southern winters a little less frigid and northern summers a little milder. In the past the difference was more dramatic. The timing of perihelion in the year changes slowly. Right now perihelion happens in northern winter, while 11,000 years ago it happened in northern summer. That changed the severity of the seasons. If we wait even longer (several hundred thousand years) the shape of the Earth’s orbit also changes, with the eccentricity changing from nearly 0 (almost circular) to the current value of 0.0167 to 0.06. A circular orbit means the distance to the Sun does not change, while a more elliptical orbit means the amount of sunlight hitting the Earth changes even more during the year. Right now the amount of sunlight hitting the Earth at perihelion is about 6.5% greater than what hits the Earth at the furthest distance. At an eccentricity of 0.06 that would increase to 27%. These are just two of the Milankovitch cycles that were developed to explain glaciations. SDO instruments were built to allow for the changing distance and apparent size of the Sun during a year. But it’s nice to know that those changes do other things as well.